Description - The Snow Goose is smaller than the domestic goose and averages a height of 25-31 inches. It is pure white with black wing tips, it's bill is pink with black "lips" and the legs are pink. A variety of the same species, but which has a dark phase, have spread westward in recent decades and is called the "Blue Goose". It's upperparts are a bluish-grey and the underparts are brownish. Distribution - The snow goose breeds in the Arctic regions of North America on the tundra and winters on the Pacific Coast from southern British Columbia to Baja California in salt marshes and marshy coastal bays; less commonly in freshwater marshes and adjacent grainfields. Biology - During the long spring migration the snow goose pauses on prairie marshes where it builds up a good fat reserve as fresh plant shoots are scarce in the far north. All winter this goose grazes fields and marshes. These birds spend nights resting on open waters. 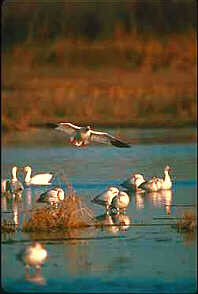 The snow goose nest in colonies in a nest sparsely lines with down; each nest contains 4-8 white eggs.